Submitted Photo Len Geiger, Alpha-1 Advocate with Dohmen Life Science Services and double lung transplantee shared his journey with Alpha-1 and transplant story at the “Strickly Alphas” support meeting held December 10, 2015 at the Ponderosa Steak House in Wheelersburg, Ohio. Len has appeared on CNN, World News Tonight, Discovery Health, The Today Show, and featured on the cover of several magazines. Strickly Alphas is a support group for those who have Alpha-1, or COPD or those with family members who have been diagnosed with lung or liver diseases. Our mission is to provide awareness and support for Alpha-1 or COPD patients. For more information please contact Amanda Holsinger at 740-858-0405, stricklyalphas@gmail.com or Ann Dissinger at 740-858-4242, mdissinger@columbus.rr.com. 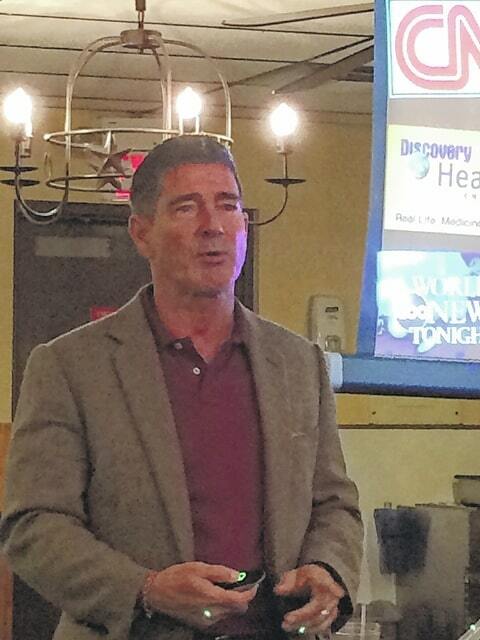 Len Geiger, Alpha-1 Advocate with Dohmen Life Science Services and double lung transplantee shared his journey with Alpha-1 and transplant story at the “Strickly Alphas” support meeting held December 10, 2015 at the Ponderosa Steak House in Wheelersburg, Ohio. Len has appeared on CNN, World News Tonight, Discovery Health, The Today Show, and featured on the cover of several magazines. Strickly Alphas is a support group for those who have Alpha-1, or COPD or those with family members who have been diagnosed with lung or liver diseases. Our mission is to provide awareness and support for Alpha-1 or COPD patients. For more information please contact Amanda Holsinger at 740-858-0405, stricklyalphas@gmail.com or Ann Dissinger at 740-858-4242, mdissinger@columbus.rr.com.